My love of potatoes knows no bounds. I’m especially fond of breakfast potatoes. This morning when I woke up and started rummaging around in the refrigerator for something to eat on this bright Sunday morning I was instantly drawn to last nights leftover casserole of scalloped potatoes, zucchini, red peppers and ham. “Eat me Erin! Eat me Erin,” it seemed to call from under its snug Press’n-Seal cover. I somehow managed to resist the cheesy temptation momentarily before I moved on to another, slightly more morning appropriate option. 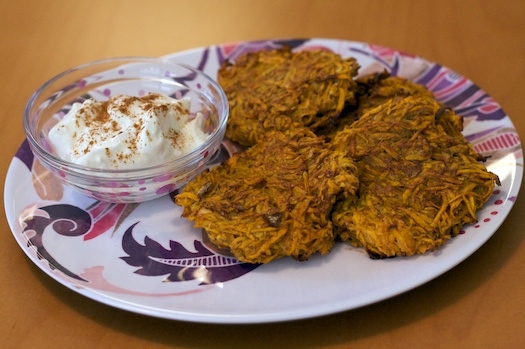 I decided to make sweetly spiced sweet potato latkes and bake them. Baking was the ultimate concession as yesterday morning I shamelessly coaxed CK into picking up a box of munchkins for us to snack on all day. These latkes are thicker than the baked russet potato version that I made previously, and much more hash-brown like in consistency. Don’t forget to top them with your favorite condiments. I prefer sour cream, light of course — sticking with the whole donut guilt theme, but apple sauce or a fruity yogurt would also be a great addition. Preheat oven to 400°F. Spray a cookie sheet with nonstick spray or use a silpat. In a large bowl, combine all ingredients. Drop by 1/3-cupfuls onto cookie sheet. Flatten with spatula. Bake for 25 minutes; flip and bake for an additional 15 minutes. Serve with light sour cream and a dash of cinnamon and nutmeg. Yowza, these look SO GOOD. I just *love* anything with sweet potatoes, but I’ve shied away from making latkes b/c I was kind of lazy and didn’t want to have to panfry them in batches. I need to try these — I love your idea of baking them! Yum yum! These look delicious. I am a new fan of sweet potatoes, as of last Thanksgiving. Erin, WOW! These look wonderful, can I have some? Did you use a FP to grate? Is that what I saw? these look amazing! I’m a sucker for anything sweet potato though! Those look great! I have to try this! Ooooh, I could have those and be very happy! Me and AHP have gluten-free pancakes with applesauce every sunday morning before our ride. 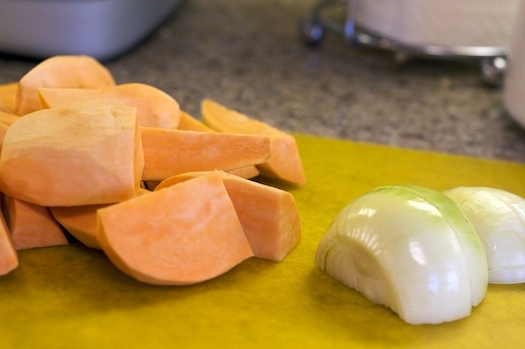 This sunday we’re having your sweet potatoes (slow-burning carbs are great for biking). another brilliant post EC! ooh, i love latkes. regular potato and onion, fried, are my favorites, but i also love half sweet potato-half zucchini. made the same way, you just gotta wring most of the liquid out of the zucchini. OH MY WORD. I must make these immediately. Thank you for the fabulous idea! I’m with you Erin! I love potatoes … fried potatoes are even better. So, I may try frying them instead of baking them. oh so lovely! i love love love love sweet potatoes!!! Oh Mr. Potato I love you!! Those look fantastic! Yum! We must be on the same wavelength. I just posted about potato pancakes with green onions and garlic. I will have to do yams next time. So tasty! Erin, this dish really makes our day. Our love for the humble potato is boundless too. We make potato pancakes, but they are fried, fried, fried! We fry with grapeseed oil just to make ourselves feel better about the eating them, but I really don’t think it makes a difference in our cholesterol count. I can tell these baked potato latkes taste wonderful and probably have 1/2 the fat of our fried potatoes. This is a good way to start off spring and without having to give up on potatoes. Thanks! There is a similar dish in the Philippines called “ukoy”. Same principles but kabocha (japanese squash) is substituted for the sweet potatoes and whole shrimp is added on. We also use a spicy vinegar mixture as dipping sauce. Your recipe looks so delicious and I am certainly gonna try it with the yogurt. Thanks! I tried to make these today for Easter Brunch. I think I made the mistake of putting them on a sil pat. . .they stuck to it and burned around the edges. I will definitely try them again on the direct cookie sheet. Ooo these look good. I love latkes. I’ve made them with zucchini before even but haven’t tried sweet potato, and I love that they’re baked! I think I’d omit the spices and maybe add some chopped green onion. I made these with jalapenos, cumin, a touch of hot sauce, and scallions. Great success! They’re delicious with salsa on top, too. A very nice accompaniment to fajitas. I’m going to make them for my girlfriend, she loves sweet potatoes. I wonder if they would go good with Okinawan sweet potatoes? Stumbled across your great recipe in my quest for a baked version — many thanks for sharing. Their foundation will definitely be added to my sweet potato arsenal! I just made these for my post workout meal. Excellent. I even got an extra workout in grating all the potatoes! I was just about to use my sweetpotatoes in a casserole dish whenI came across your latke recipe. Wow, less clean up involved and at age 84 I;m not crazy about a lot of cleaning up. 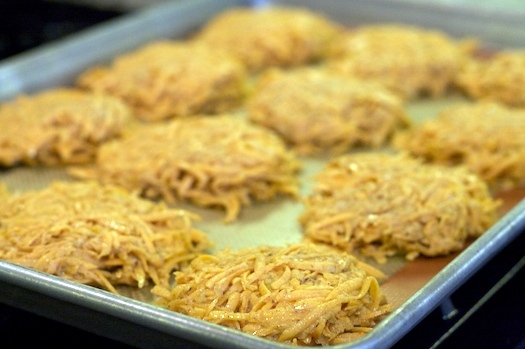 So tonight it’s sweetpotato latkes… no heavy casserole dish to soak and scrub. Thanks. I have tried making these twice this week of Hanukkah. Each time, the latkes burned to the PAM spray oiled cookie sheet and I had to scrape them off to flip over for the second baking period. The latkes tasted wonderful and were a big hit but at least a third of it was left on the sheet each time. Any suggestions? Have you ever tried cooking with a silpat? I use them all the time. If you enjoy this recipe then you may want to trying using one instead of just PAM spray. I made these tonight for dinner. 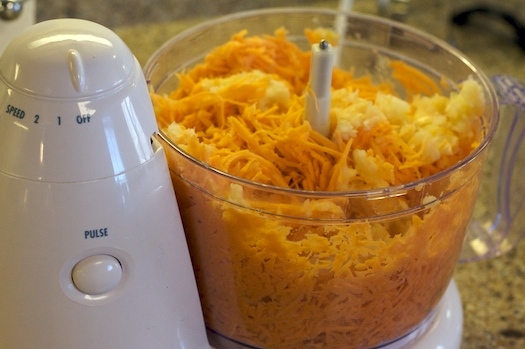 Preparation was very easy and quick with a food processor, although I was very disappointed in the finished product. I followed the recipe exactly and although they smelled delicious while they were baking, the taste of nutmeg was so overwhelming that I really couldn’t enjoy the latke. If I were to ever make this again I would tweak it. 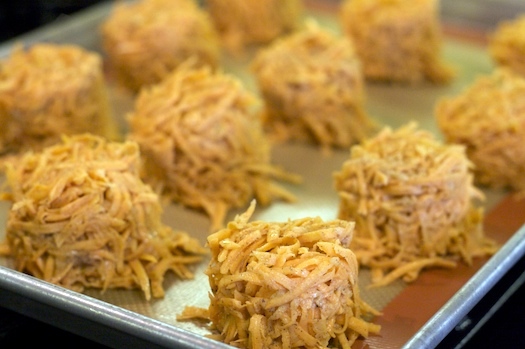 I made these sweet potato latkes to accompany a pork tenderloin recipe. Yummy. Love that they were not fried, but bakes. Totally nonfat. I used FAGE 0% plain yogurt for topping. Perfect. Also good leftover. I’ve been making this recipe ever since I stumbled on it by chance, and thought it’s high time I thanked you for it… It’s become my signature appetizer at parties. I simply line my cookie sheet with parchment paper – never had a problem. 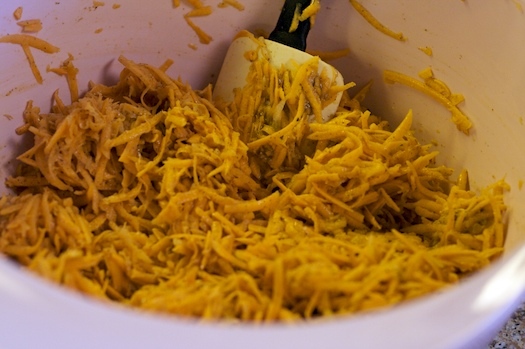 I add about 3 to 4 tablespoons of fresh chopped chives to the “batter”. Serve it at room temperature, topped with a dollop of creme fraiche, a small roll of smoked salmon, quarter teaspoon of salmon roe (red caviar), and a couple of short chive stalks as decoration.